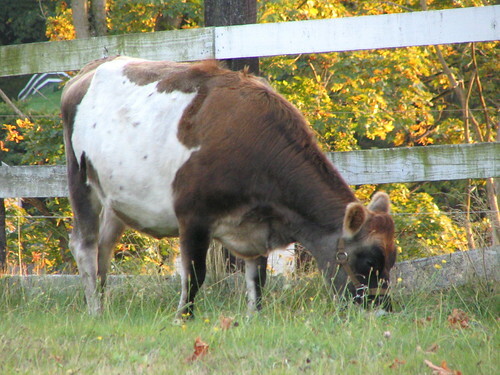 Farm animal on Beacon Avenue South, October 2008. Photo by Jason. Though South Beacon Hill looks suburban now, within living memory it was rural, with woods and farms. The large P-Patch near MLK and Henderson gives a hint of the old Beacon Hill and Rainier Valley, but that’s not the only sign of the old rural South Seattle. A couple of weeks ago, Jason and I were down on Renton Avenue, near Vince’s, and decided to drive up the hill and try to take a good picture of the Chief Sealth trail. We did, and then kept driving a bit to see what else was up there. We soon found ourselves on the southeastern segment of Beacon Avenue South, which, though it seems to end when it merges with 39th Avenue South on South Beacon Hill, starts up again east of MLK and continues down to South 128th Street in Skyway. And there, near South Bond Street, we saw… a cow. The one you see in this picture. Right next to the road, happily munching away at some grass. We stopped the car to take this photo, and heard the sound of horses whinnying. In Seattle, of all places. It turns out that this cow is Vaca, the family cow at Sferra Farm, the last working farm in Seattle. The 20-acre horse farm has been there since 1919, and now it’s the last vestige of a South Seattle that once was. Recently the Sferra Farm made the news because the city’s new rates for drainage tax threatened its survival (the City Council later amended the drainage rate ordinance), and because of this you can see more pictures of Vaca and Sferra farm at Richard Conlin’s photo gallery and on Dori Monson’s website at KIRO radio. The area where the farm is located is called Rainier Beach on the city’s neighborhood map, but just barely (the boundary on that map is MLK). The farm and its area are discussed in Chapter Four, “South Beacon Hill,” of Seattle’s Beacon Hill , by Frederica Merrell and Mira Latoszek. I love Vaca’s fuzzy, soft-looking ears. It was a nice unexpected surprise to see a farm animal in the city. Darn. I was hoping you were talking about a cow actually in the street. Still, it does show that Beacon Hill is more diverse than anyone thought. No, it wasn’t in the street, but it could have been! It wasn’t behind the fence, it was busy chomping grass just four or five feet off the side of the road, untethered and unrestrained. Yeah, that was part of why it was so strange. It wasn’t even behind a fence. With all due respect to you lovely folks over there across the way on Beacon Hill, our little neighborhood is called Rainier View, and it’s the southernmost tip of Seattle. Admittedly, Beacon Ave does run through here on its way to points south, but Rainier Hill is it’s own place. And we have horses, and a cow. Is this farm still going strong? I just ran across this blog on Vaca. I am so glad people enjoy her. My family has had their milk cow out eating the grass on the edge of Beacon Ave since 1919. I have pictures of my great uncles and great grandfather in this same place with their cow. Currently, several neighbors are on a rotating milking schedule with Vaca and it is very nice. Wow…blog resurrection time! I was looking at real estate for this area and found a home that I was interested in on Beacon Avenue. I decided to do some due diligence and utilize Google Street View to check out the neighborhood. The scene popped into view and it was of a horse grazing next to the street! I had to rub my eyes and confirm the address. What a nice surprise to see this.